It was the type of throwaway gag that entertains Twitter users for a few hours before forever fading from memory. But Rudy Giuliani preserved it in amber by following up Tuesday with the baseless accusation against Twitter. To Rudy Giuliani, the former New York mayor who is one of President Donald Trump’s lawyers, it was an example of how low Twitter would stoop to carry out its anti-Trump agenda. It was, decidedly, no such thing. It was just a typo, followed by an opportunistic prank by an improv actor in Atlanta. 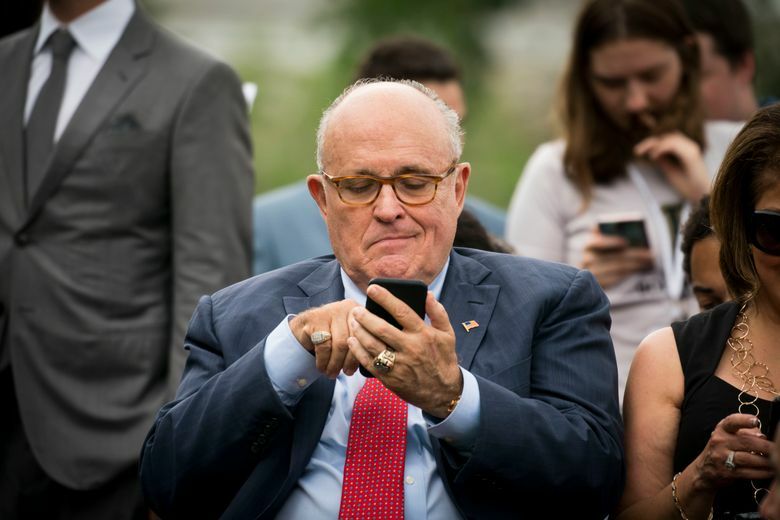 In a tweet Tuesday, Giuliani said the social network had “allowed someone to invade my text with a disgusting anti-President message.” He was referring to a Nov. 30 tweet in which Giuliani — by failing to put a space after a period, and starting the next sentence with the word “In” — had inadvertently created a hyperlink. G-20.In is a real domain name, but it hadn’t been used before Giuliani tweeted it. Twitter automatically converts such valid links into blue, clickable text. When Jason Velazquez, 37, who owns a web design firm in Atlanta, saw the tweet, he immediately bought the domain for about $5. He then created a page with a simple message, which anyone who clicked on Giuliani’s accidental link would see: “Donald J. Trump is a traitor to our country.” The entire process took him about 15 minutes, Velazquez said Tuesday. A Twitter spokesman said “the accusation that we’re artificially injecting something into a tweet is completely false.” The company does not have the ability to edit users’ tweets, he said. As to Giuliani’s argument that the second “period no space” instance in his original tweet didn’t create a similar link, that’s because Helsinki.Either, so far, is not a working domain. Nor is it the first time that politicians have run into issues related to domain names. Sen. Ted Cruz of Texas, for example, doesn’t own the www.TedCruz.com domain, which led to the site displaying a pro-Hillary Clinton message shortly after he dropped out of the presidential race in 2016. Velazquez said he’d had little time to carry out his mischief last week. He saw Giuliani’s tweet at 6:20 p.m. and had to act in an improv show at 7 p.m. He was at another improv show Tuesday when he saw Giuliani’s follow-up. He said he was bewildered.